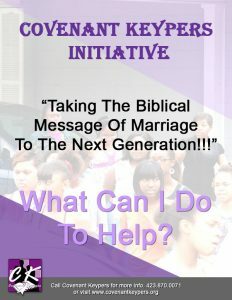 Covenant Keypers, Inc. is seeking 500 sixty dollar ($60) donors to help take the biblical message of marriage to the next generation! As people of God, we know that the first marriage took place in the Garden of Eden with Adam and Eve. But unfortunately, today’s culture may never hear the biblical truth about marriage unless we unite and intentionally make it a part of everyday life. Covenant Keypers wants to do just that! We want to ensure the next generation’s culture hears the biblical account of marriage and all the wonderful things the Bible teaches us about God’s design for it. Won’t you join us as we infuse God’s Word about marriage into the community through media applications everywhere: TV, radio, newspaper, magazine, internet, clothing, billboard, school, college, etc. All we need is people like you, your business, or your church to help underwrite this $30,000 Biblical Message of Marriage Initiative (BMMI). The best way we can help you give to this initiative is to simply ask, seek, and knock. First, pray and if you are still unable to give a donation of any amount, we trust you won’t throw this “ask” to the side. There are lots of Christians in and around Chattanooga who would love to give and you can help us reach them. Please pass this letter on to others you know. You may also download, print out, complete and mail the “BMMI” form with your tax-exempt gift to Covenant Keypers, Inc., P. O. Box 340, Hixson, TN 37343. Or you may donate via Givelify by clicking the red Donate button. Also, be sure and check back with us soon to preview some of God’s messages about marriage on our website.